3. Render content according to the user’s needs. Progress has been made on customising Open Journal System (OJS) for the new publications of the AGORA project. In addition, Alessio Piccioli and Federico Ruberti of Net7 have worked on the ‘Agorization’ of metadata, that is, on customising metadata standards specifically for the Linked Open Data Experiment, as well as for the Semantic Linking Experiment. 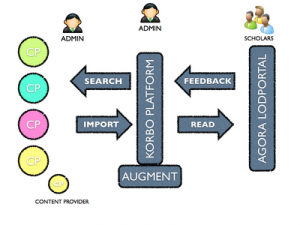 Net7 developed the first version of the Agora LODPortal: it is a web application based on the API of a new tool of the MURUCA platform (that is the evolution of the TALIA software) called KORBO (http://korbo.muruca.org). Some effort has been dedicated to further customize the KORBO tool features in order to be suitable for the lodportal experiment, at the same time the platform’s node and OJS instances have been customized in order to be used by the KORBO tool.